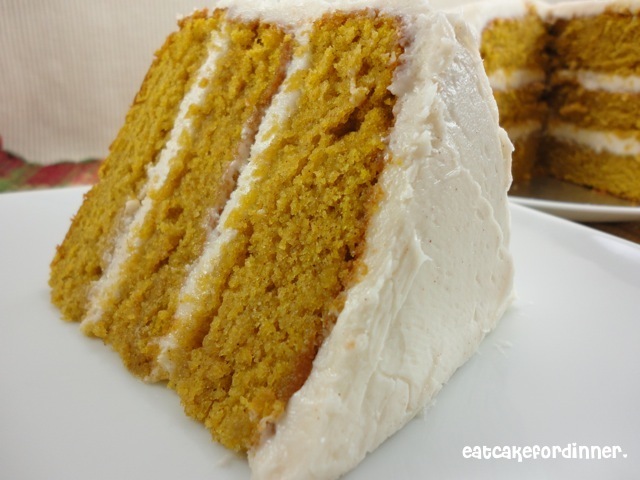 This is the BEST, from scratch, pumpkin cake that I have ever had! I knew it would be delicious as soon as I saw the picture in my Paula Deen Holiday Magazine. I am seriously so impressed with this cake. I made it last Thursday and it still tastes delicious today (Monday). I hate it when I try a new cake recipe and it tastes great the first night, but it just keeps getting more dry as the days go by. That is not the case with this cake. It is still as moist as ever! The texture and the moistness reminds me of a carrot cake. I loved this cake and it most likely will be making an appearance at my dinner table this Thanksgiving! I made a three layer mini cake, some regular cupcakes and these skeleton cupcakes out of this cake recipe and they were all amazing! Oh goodness, I did not need to see this! I looks so delicious, delicious as in, I'll probably dream about it tonight!! LOL! 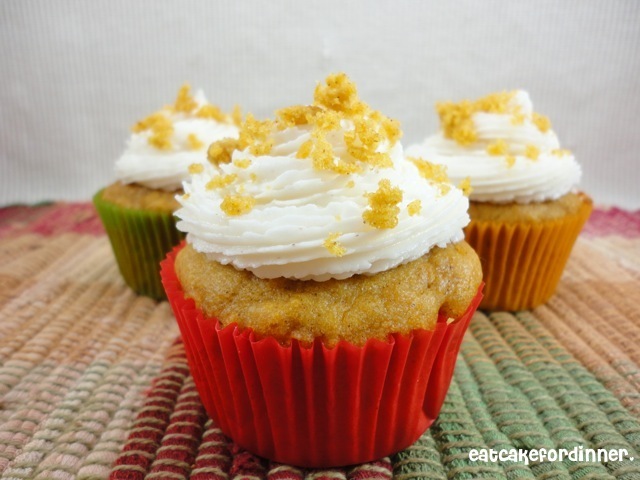 Wow, it certainly does look moist and delicious and the idea of cinnamon buttercream frosting is too hard to resist. holy cowwwwwwwwwww- paula's recipes are always spectacular and it looks like you've done amazing work here! ha, 2 cups of butter, my gosh.. yum! Oh wow, this sounds amazing! I'll have to try it for sure. Your pictures are beautiful! This recipe sounds amazing!! Thanks for sharing. 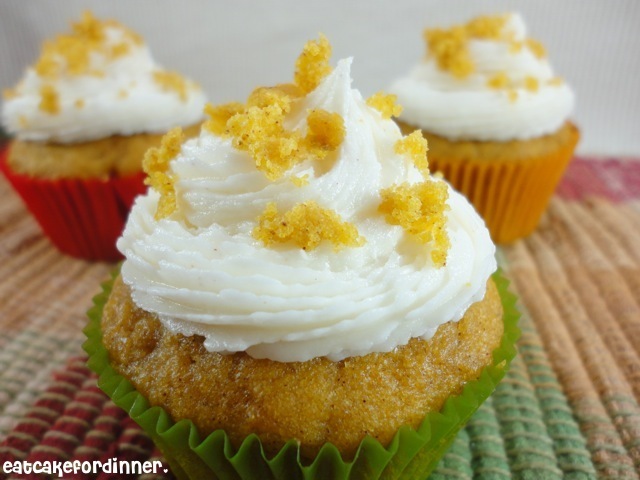 I would love for you to add all your fabulous pumpkin recipes to my pumpkin linky party. Wow this looks yummy and you make it look so perfect! That looks and sounds delicious. I will definately have to try this recipe. Your cupcakes look fab!! Made the pumpkin cake this weekend but used bananas instead. My banana cake loving husband declared it the best he's ever had. This cake was AMAZING! WOW! Just wonderful fall flavors! Came out so moist! Was pretty easy to make! Brought it to a Thxgivin get to gether and got oooohhhs, ahhhhhs, and wows! Thanks for posting the recipe! YUM! Your cake roll looks delicious. I shared a candied sweet potatoes recipe today. Thank you for hosting us again and have a great week! I made this tonight. Very good. I would add some pumpkin pie spice to the cake next time. A little bland for our tastes. The icing is very good. The cinnamon really adds to the taste. How much pumpkin pie spice would you add? I would start with one teaspoon, taste the batter and add a little more, if needed. I need to make this in an 9 x 13 pan for my husband's birthday. What temp and how long do you think I should bake it? Thanks! Hi, what size is your cup? Do you think this will work with pureed pumpkin rather than tinned? Sounds delicious! I've never tried it, but I would think you could use pureed pumpkin instead of canned. Any suggestions for baking this at a really high altitude, as in 7,000+ ft. above sea level? I live at about 4600+ feet above sea level and I honestly don't make adjustments except for when I make candy. I know there are certain things you are supposed to do, but I would have to look them up since I don't do any myself. I made the cake, and it was perfectly moist, and complimented the cinnamon buttercream as well, but it seemed a bit plain. The cake was missing something. I added another 1/4 tsp of cinnamon to the frosting, and it made it much more bold. But the biggest boost came from the chopped pecans I layered onto the top. The crunchy texture broke up the softness and the flavor was a perfect match for the fall cake. Next time I make it, I may throw in 1/4 or 1/2 tsp of nutmeg so the cake would stand out more. I just finished baking cupcakes with this recipe and they came out well. Light and fluffy, even though I increased the cinnamon and added more spices it still could have done with more. Overall a good recipe so Thank You!